Statement from the Artist: To the left we are met with a raging bull preparing for another charge against a large wall. 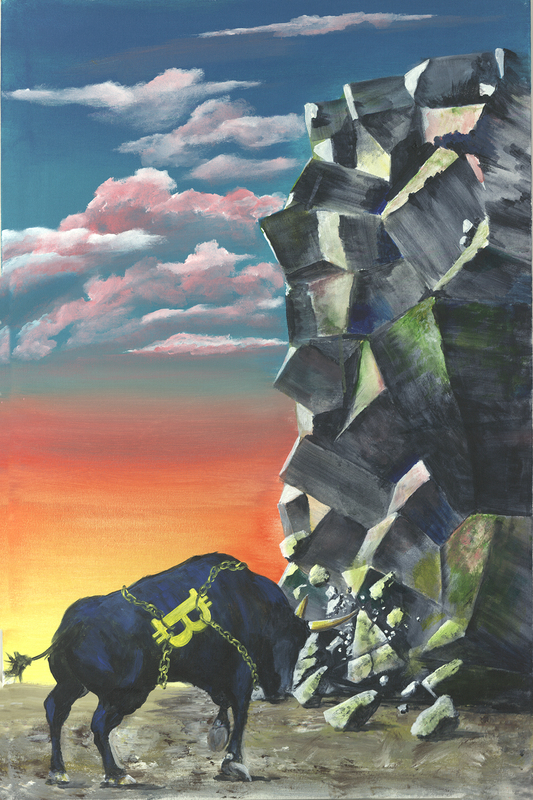 The bull coupled with an upwards-facing, golden Bitcoin symbol that he is seen to be carrying represent the start of a bull market and a rise in the value of Bitcoin. The wall is composed of large rock formations that can be construed as the very blocks that make up Bitcoin. The wall can also be more appropriately interpreted as a market ‘ask’ wall that the bull is hammering down and must overcome. The wall contains hints of green to symbolize the current USD paradigm. The painting also features warmer tones to emphasize on the stresses, frustrations, and uncertainties of the market.